In the Store Record, Enter R in the field, "(F)ine dn,(R)etail, f(A)st". This is what the system to Retail. If you will scan items and use the touch screen, make sure to type the cap letter I in the field "special code". Otherwise you can leave the field blank. 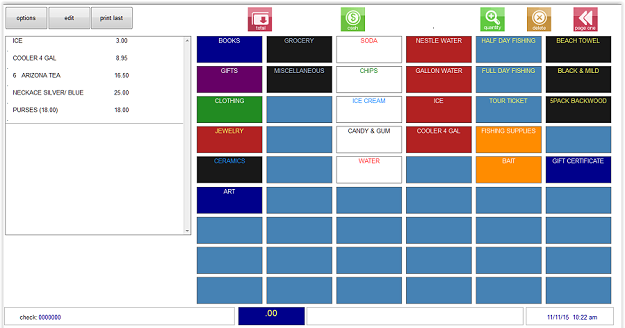 If your POS items are created from Inventory item setup , a configuration might be required if you want those items available on the POS screen as well as from scanner or keyboard setup. 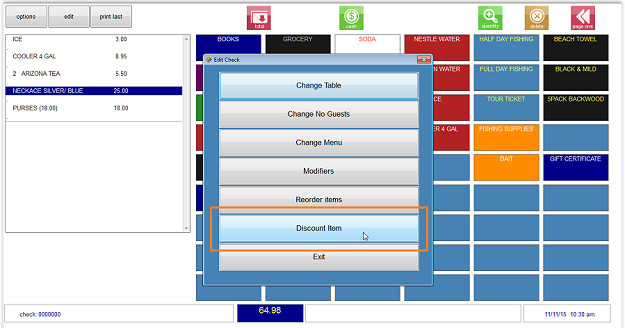 By default they import into POS with "Y" in the menu pricing fields, meaning they are not shown on the POS screens. For the items to show on the screen you need to enter "A" beside the menu price. They can be imported from Inventory to POS with "A" via a MENUINI configuration option. A will make them available on the POS screen as long as the item or category is set up in the keyboard (item button) setup for that menu and terminal ID. Some of the features in the Execu/Touch Food & Beverage mode are not available in the Retail mode. Examples include table selection, split checks, credit card preauthorization, and tip entry. You can use a touch screen or scanner to enter retail items. 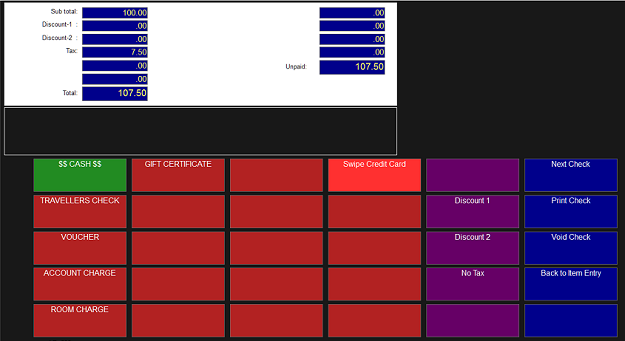 Without a touch screen or scanner you can use your mouse to click the item on the screen you can type the item code. Wine cellars often run in Retail mode for standalone sales, but can operate in Fine Dining for dinner sales if separate POS stores (companies) are set up. 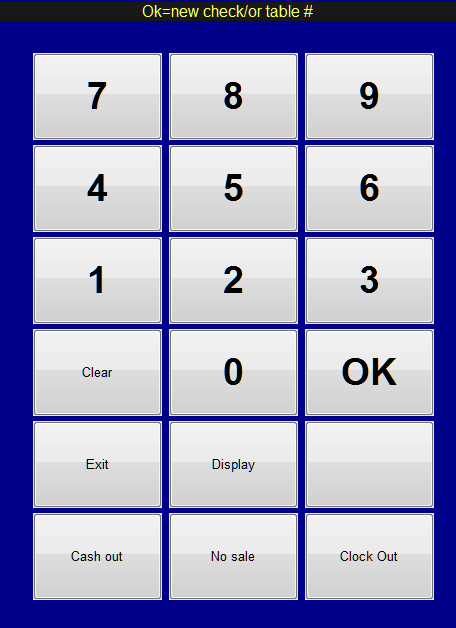 After you log in you will see a keypad over the item entry screen. Most of the time you will just tap "OK". Should you need to get to the Main Menu so that you can access other functions, touch the "Exit" button. These functions are discussed later in this document. Select "Display" to display checks. 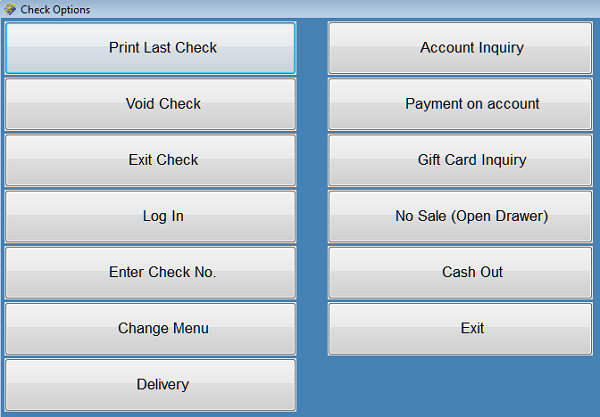 Select "Cash Out" to print your cashier report. Select "No sale" to open the cash drawer. Select "Clock Out" to clock out if you are using the Time & Attendance function. Select "Exit" to exit the system. Note: For users set up with "Y" in the "Default Quick key?" 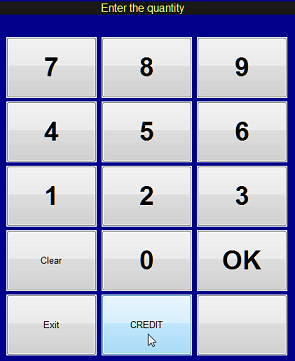 field in Employee Setup, the keypad will not display. When you select OK you will see the item entry screen. 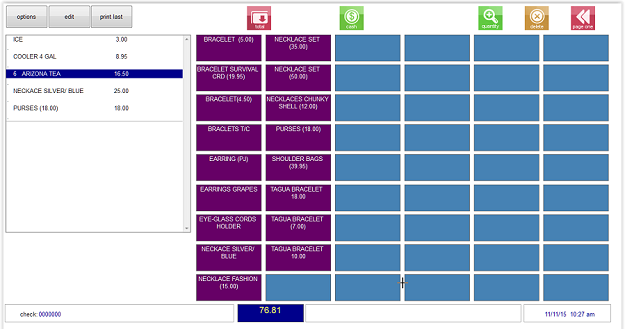 The screen may be set up with item categories or individual items or a mix. You can scan item barcodes or you can use the following instructions for touch screens. You can touch the item button on the screen, click the item button with a mouse, scan the item's barcode, or type the inventory item code. If a category is selected the items in that category will display. 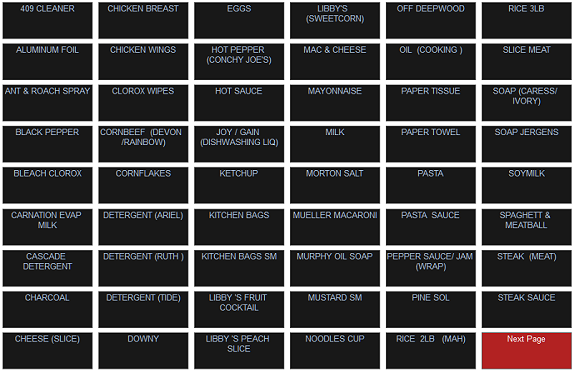 Select the items. 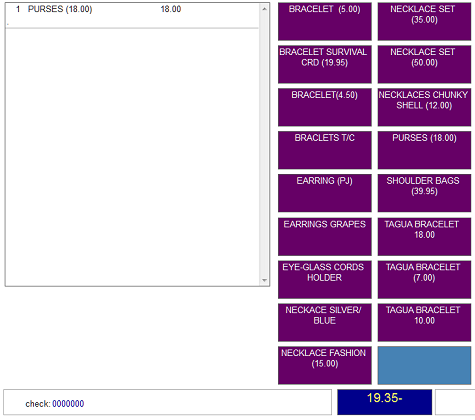 The items will display at the left, as shown below. The total (including tax) displays. To sell a quantity, you can touch the button more than once or you can touch the green "quantity" button at the top prior to entering the item. A keypad will open. Select the quantity and then OK. If all of the items in a category are not visible, you will see a red "Next Page" button at the bottom right. To exit POS or return to the login screen, go to Options then Exit Check. See POS Supervisor for End of Day procedures. 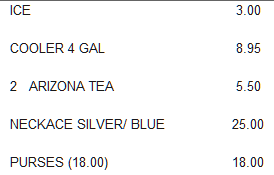 To apply a percent discount to an item, touch the item (it will highlight in blue as shown below) then select the "edit" button at the top of the screen. When the "Edit Check" menu opens, select "Discount Item". In Retail Mode, "Discount Item" is the only function you will use for the "edit" menu. 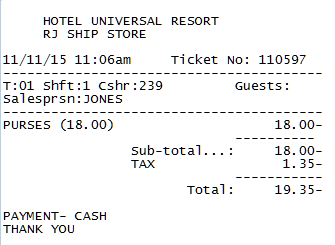 At the prompt, enter the discount percent as shown below then OK. 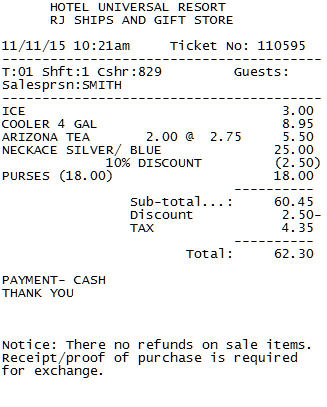 Here is the receipt showing the discount. Dollar discounts must be done on the Total screen. To issue a credit, select the green "quantity" button. At the prompt, select "CREDIT" and then the number of items to credit. This is what you need to do for a prior-day return, as you cannot void a prior-day check. Then select the item to credit. 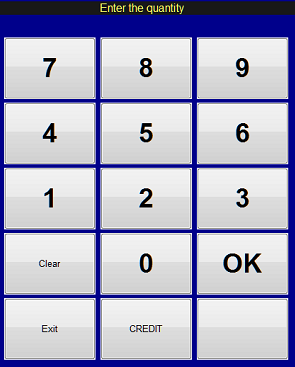 When the keypad displays after login select "Exit". If the blue keypad does not display when you log in, you can go to Options > Exit Check. The following functions are available, except "Transfer checks" which is for Food & Beverage only.